Oil and water don't mix! 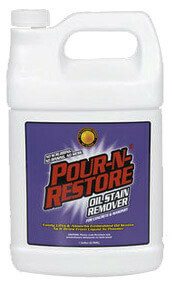 So, before you pressure wash, get rid of that unsightly oil stain with our amazing line of oil stain removers designed to emulsify and remove oil without hurting the environment. Lifts and removes oil stains from cement, exposed aggregate, quarry tile, stone, patio blocks, paving bricks, and colored concrete. Ideal for use on garage floors, driveways, sidewalks, patios, parking lots, drive-thru's, manufacturing floors, warehouse floors, and other concrete and masonry surfaces. Effectively removes a variety of hydrocarbon stains, including stains from grease, motor oil, anti-freeze, hydraulic fluid, brake fluid, power steering fluid, transmission fluid, cooking oil, synthetic oils, food grease from animal fats, tar, citronella oil, and wax. Dries oil stains into a powder. Powder can be swept up with no scrubbing or rinsing. NOTE: Not for use on asphalt (black top).